Jennifer Jones was born in Halifax, Nova Scotia, where she received her early musical training from Jean Fraser, who nourished her love for the violin and music. Jennifer continued on with Phillipe Djokic at Dalhousie University and Josef Gingold at Indiana University where she graduated with a Masters in Music in performance and pedagogy. She then spent time in Nice, France studying with Sylvie Gazeau of the Paris Conservatoire. Jennifer is presently a member of Symphony Nova Scotia, an avid chamber musician and an accredited private violin teacher. Her performances of chamber music throughout the Maritimes have been recorded frequently by the C.B.C. 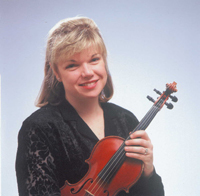 She has adjudicated at various music festivals throughout the Maritime Provinces and has also taught violin and chamber music at Acadia University. One of Jennifer’s favourite musical endeavours is her work with the Nova Scotia chamber music series, Blue Engine Music of which she is a founding member. When not performing or teaching, Jennifer can be found relaxing with her husband Jamie Ferguson, their sons Noah and MacKenzie and their golden retriever, Belle.